Actually this salad had some lettuce and brussels and apples and walnuts and parmigiana cheese!!!! A-mazingly delicious and super fresh tasting. I found it on a blog site Once Upon a Chef and made a few changes to it but it was absolutely delicious. Easy ingredients and you can prep ahead and stick it in the fridge all dressed and ready to go. My kind of salad and one I will be making all winter long. The original recipe called for all brussels sprouts but I did 1/2 lettuce mix and 1/2 brussels. You can do whatever you’d like . Dressing was fresh and sweet because of the honey. This would be amazing as a dinner salad with any protein added. *salad should serve 4-6 as an appetizer size salad. 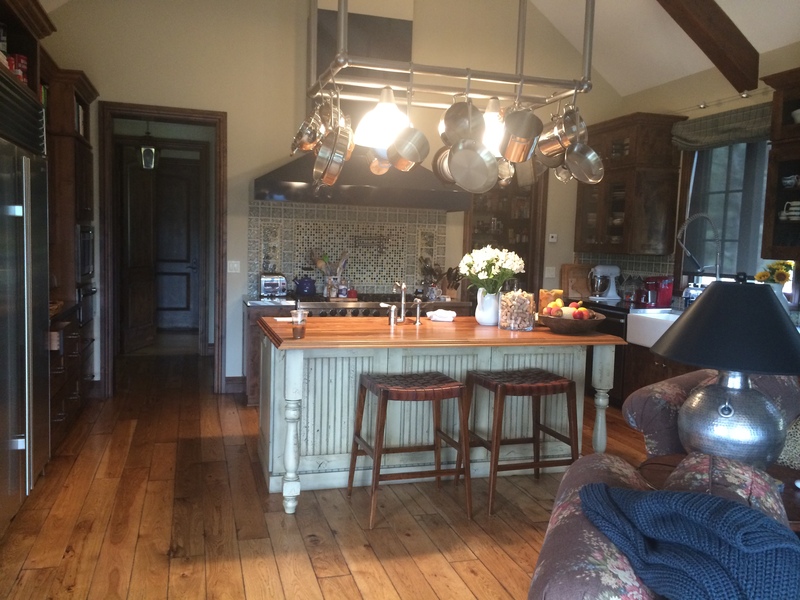 3/4 cup walnuts, toasted and coarsely chopped –to toast the walnuts –pre-heat the oven to 350 degrees and set an oven rack in the middle position. Arrange the walnuts in a single layer on a baking sheet. ( no need to spray or oil the pan) Bake, checking frequently until lightly toasted and fragrant (if you smell them you better remove them, they burn rather easily) set the timer for 4 minutes but they will probably take 6 minutes. Allow to cool and chop them up. 3/4 cup thinly sliced Parmigiano-Reggiano — I use a peeler to slice cheese while it’s cold it’s easier to slice. In a large bowl, combine the shredded Brussels Sprouts, lettuce, apple, vegetable oil, olive oil, shallots, apple cider vinegar, honey, salt and pepper; toss well. Cover with plastic wrap and refrigerate for at least 30 minutes and up to 4 hours to allow the sprouts to soften and the flavors to meld together. When ready to serve, toss the walnuts and cheese with the salad. Taste and adjust seasoning if necessary , then serve. 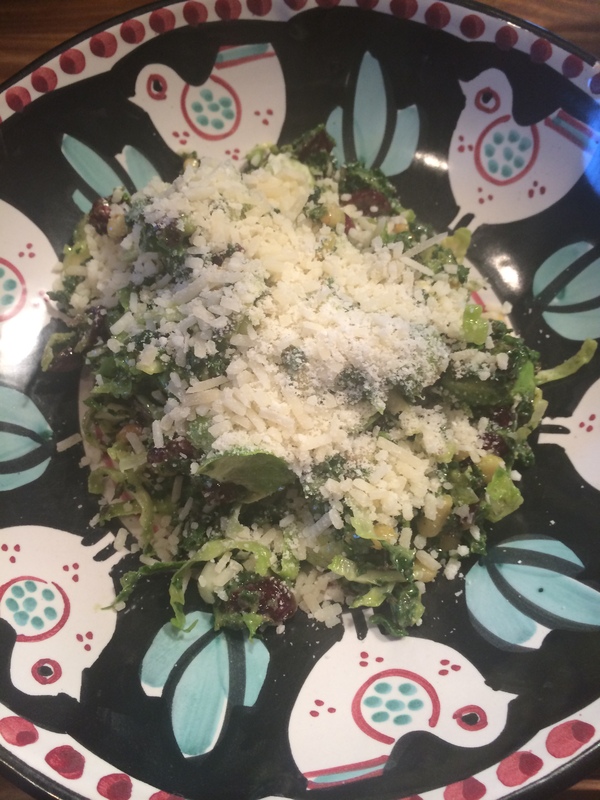 Joel’s Salad with lots of Parmesan Cheese–hey he ate it! This Champagne Vinaigrette appeared on my blog back in 2012. 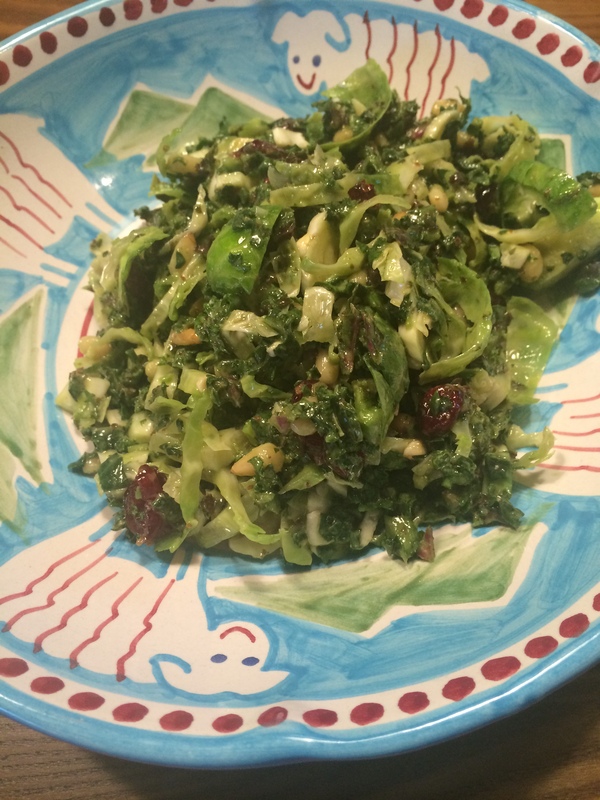 It’s really perfect on any kind of greens and this is the salad that I made along with it. I love Kale but I don’t like feeling like I’m eating the front lawn. I like my kale very finely chopped and massaged with dressing. 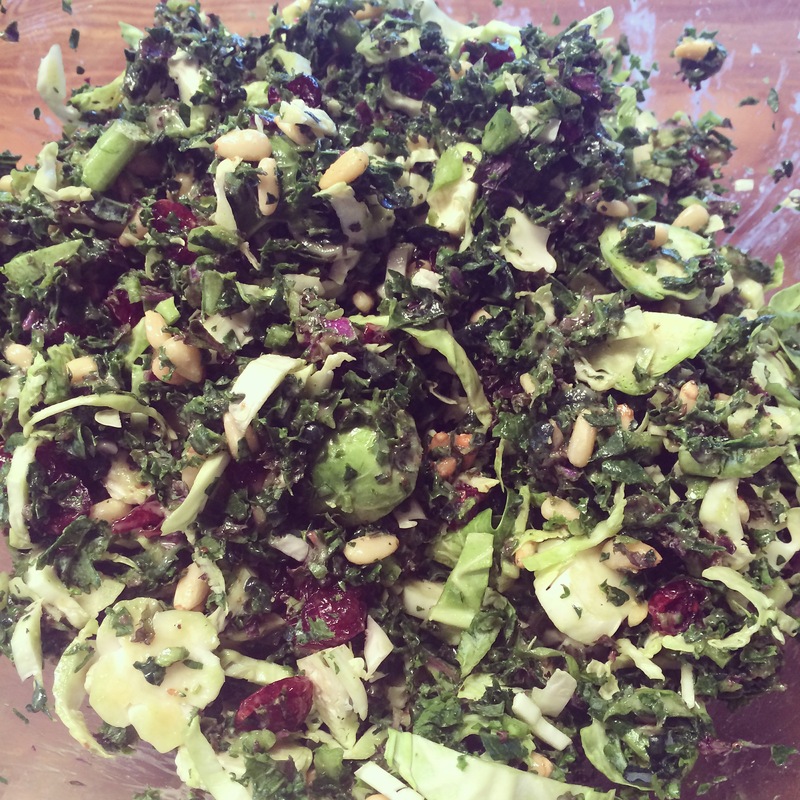 I use my food processor to chop the kale and I dress the salad ahead of eating it and let it sit for a while so that the kale can absorb as much of the dressing as possible. This salad was really delicious and I know this is almost impossible to believe but I got Joel to eat some of it! The way I did that was to add a lot of parmesan cheese to his plate and he ate it. Enjoy this dressing it is perfection in a bottle and good on almost anything you put it on. Follow me on Instagram @cookingwithcandi thanks and I’ll follow you back . 1/2 lb. of Brussels Sprouts, washed and cut thinly–now you can buy brussels already sliced which makes prep super fast and easy!!! *add any seasonal fruits or vegetables or protein you may like, this is just a basic salad idea. Using my blender I threw all vinaigrette ingredients except for the olive oil which I slowly streamed in through the top of blender until dressing emulsified. Taste for Salt and Pepper and you’re good to go. Wash and Dry the Kale, remove the stems and ribs and just use the leaves. Even better you can buy triple washed kale already chopped. I still put that through my processor because it’s not chopped enough for me. In the food processor I chopped up kale slowly, you don’t want to over chop the kale either. As soon as it starts to break down I stopped and removed it and added more. I do it in sections till it’s all chopped. Slice Brussels very thinly into slices , they will fall apart as you slice and mix them into salad. 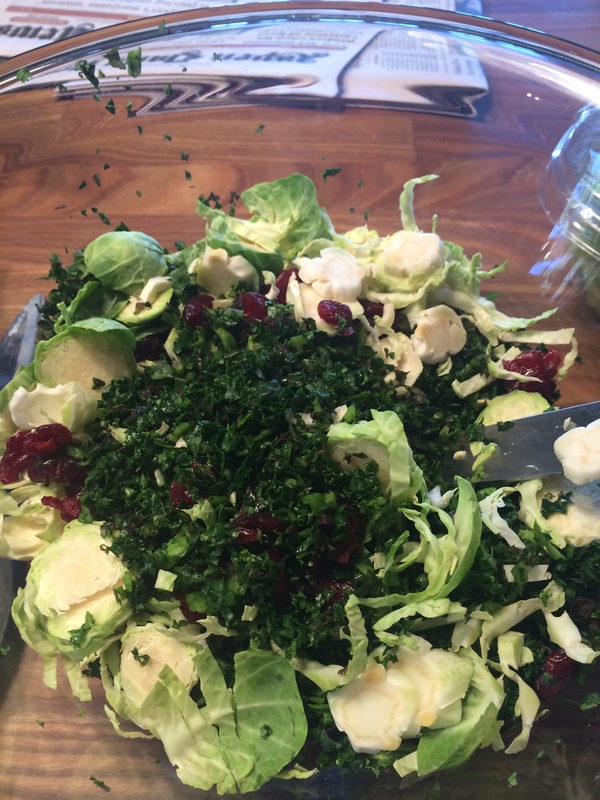 Add Brussels to Kale with all other salad ingredients except for Parmesan Cheese. I added cheese when I was ready to serve to individual plates. This Champagne Vinaigrette appeared on my blog back in 2012. It’s really perfect on any kind of greens and this is the salad that I made along with it. I love Kale but I don’t like feeling like I’m eating the front lawn. I like my kale very finely chopped and massaged with dressing. I use my food processor to chop the kale and I dress the salad ahead of eating it and let it sit for a while so that the kale can absorb as much of the dressing as possible. This salad was really delicious and I know this is almost impossible to believe but I got Joel to eat some of it! The way I did that was to add a lot of parmesan cheese to his plate and he ate it. Enjoy this dressing it is perfection in a bottle and good on almost anything you put it on. I will be making this salad for Father’s Day this year–it’s a winner. This Champagne Vinaigrette appeared on my blog back in 2012. It’s really perfect on any kind of greens and this is the salad that I made along with it. I love Kale but I don’t like feeling like I’m eating the front lawn. I like my kale very finely chopped and massaged with dressing. 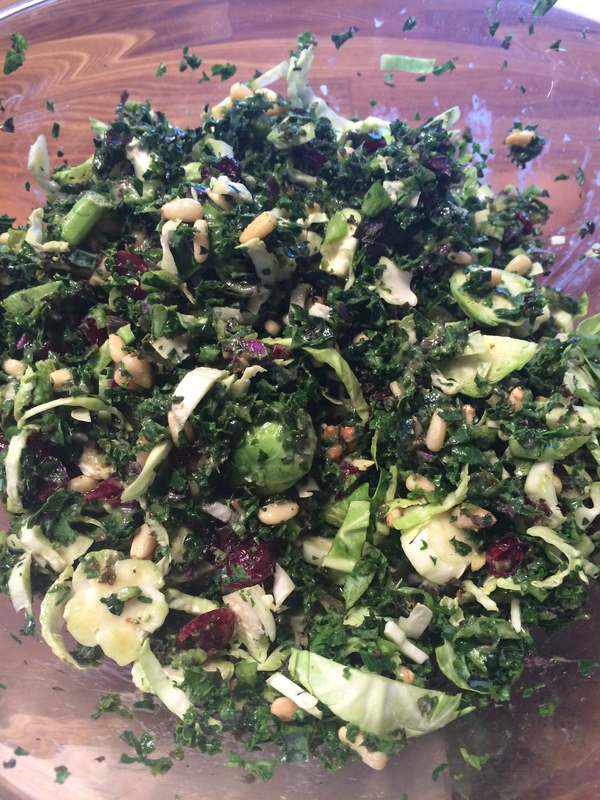 I use my food processor to chop the kale and I dress the salad ahead of eating it and let it sit for a while so that the kale can absorb as much of the dressing as possible. This salad was really delicious and I know this is almost impossible to believe but I got Joel to eat some of it! The way I did that was to add a lot of parmesan cheese to his plate and he ate it. 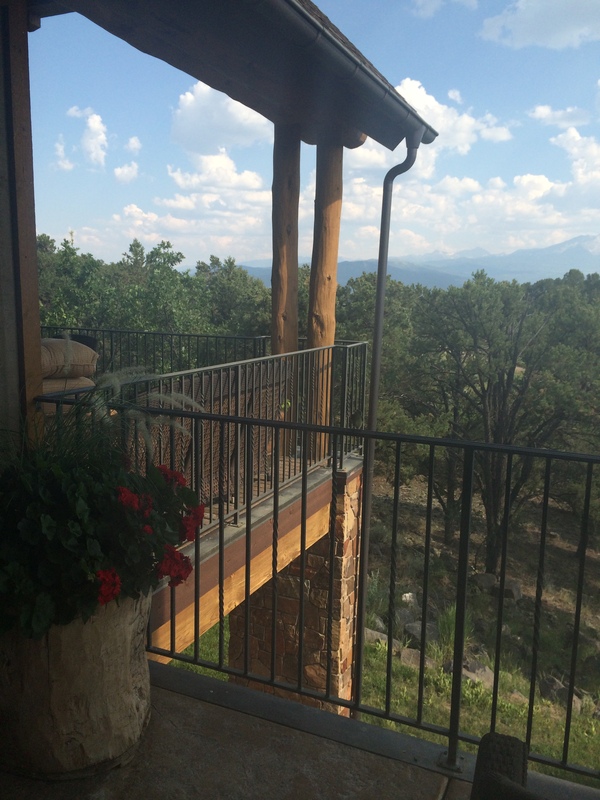 I also threw in a picture of my kitchen and a picture of the view from one of our decks . 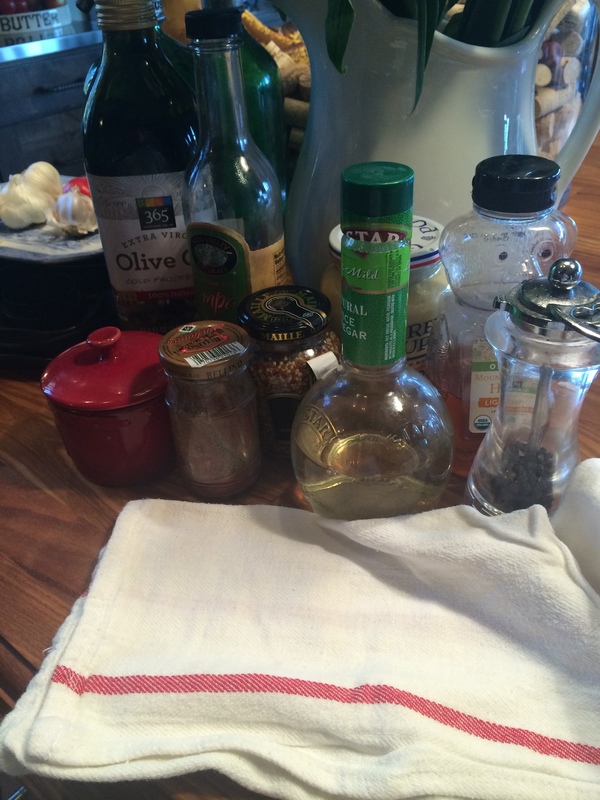 Enjoy this dressing it is perfection in a bottle and good on almost anything you put it on. I will be making this salad again and again.